With Green Lantern resurrected, the heroes of Earth 2 go on the offensive against the forces of Darkseid and Apokolips! As the heroes prepare an all out assault, plans are put into motion for the Red Tornado to make one last, desperate attempt to stop Superman. Story-Evil Superman is stooped n his tracks by the revelation that Red Tornado is Louis Lane. This manages to stop him from killing Val-Zod. Louis is taken by Superman to his former home in smallville. Green Lantern/Alan Scott saves Val Zod and Hawkgirl from the parademons and they regroup in the batcave. They are attacked by more parademons and an assortment of creatures. Connor Hawke is apparently killed while the others teleport to Themyscria. Action– The good guys vs. Parademons, necks being ripped out, disintegrating enemies etc. This one has a little for everyone. Characterization– Evil Superman has another level added to his creep factor by holding his parents hostage and being unable to reconcile his new evil self with the hero he was before. Alan Scott also deserves mention as he returns with a thunderous conviction. Alan as the truth and justice type is still present and that consistency makes me happy. Emotion- As crazy as Evil Superman is, you could still taste the raw emotion related to Louis seeing him as he is now. Likewise you could feel the fear that the Kent’s had in relation to their changed son. Black Heroes– Hawkgirl was here holding her own while Val-Zod and his pacifist stance almost cost them their lives. Because Val-Zod has been holding back this entire time it will have an epic payoff when he finally lashes out at the enemy, in particular evil Superman. Cover– Decent though not my favorite for this series; evil Superman in an almost embrace like confrontational pose with Red Tornado/Louis Lane. The style is radically different to the interior art but decent. Art– Nicola Scott’s art continues to dazzle with emotive eyes, proportional bodies, scary monsters and fluid fight scenes. This is the stuff good comics are made of! Passivity– Val Zod’s no violence stance may be jarring to some who are very tired of him just rolling over as the world burns around him. 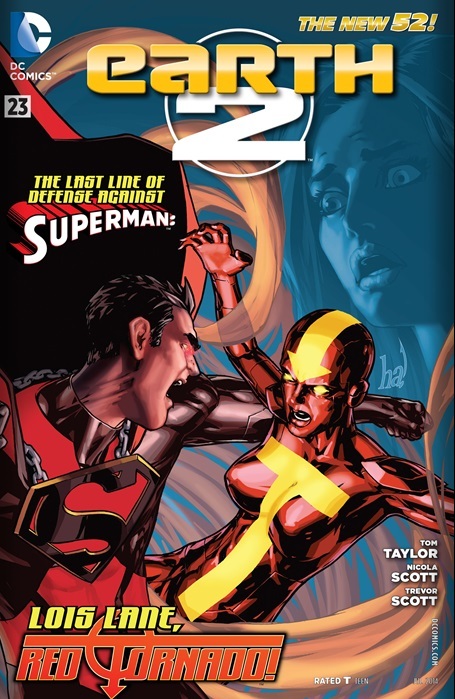 Earth 2 has great interior art, a decent cover, great action and a deep moving story. The cover is not so hot and their are story elements that will grate on people’s nerves. I give it a 3.5/5 stars! ← Fox's Gotham Cast Photo offers first look at Jada Pinkett Smith as Fish Mooney!